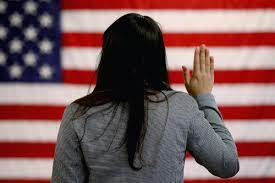 Arnold Law, LLC: Becoming a US Citizen. On this most important American Holiday it is important to reflect on the future of citizenship in the United States. About three-quarters of a million aliens became US citizens last year. Our current President estimates that there are over 11 million other immigrants living here illegally. In the year to come there will be a new President and perhaps the citizenship rules will change over time. The first step is to obtain a Green Card. Too often people come to America and let time pass without obtaining documentation. For those that have a spouse, a parent, or a minor child who is already a US citizen you are a high priority for citizenship. Also, if you have a family member who has a green card you may apply for one as well. If you or a loved one wants to become a citizen of the United States of America do not hesitate! Contact Baltimore United States immigration attorney Briana Arnold. Attorney Arnold brings the two most important elements to your situation…knowledge and compassion. She will help you throughout the process. Give her a call at (410) 484-1400. How to File a Personal Injury Claim.